Why is it that the more important the biblical site, the more it tends to be surrounded by modern buildings? Sites such as Hazor, Megiddo, and Gezer have a lower level of biblical significance (see 1 Kings 9:15) yet they are delightful places to visit because they are relatively untouched by modern developments. But take a city like Jerusalem, Bethlehem, or Nazareth, and you need to hire a professional guide to help you find the ancient remains among the modern. Take Nazareth for example. I have been to Nazareth a number of times, but I have seen few (if any) ancient remains in that city. It is completely covered by modern buildings. This is not to criticize the modern inhabitants of the city. They have a right to live there and build comfortable houses and reliable roads. I am merely pointing out that often modern developments can diminish the usefulness of a location for teaching purposes. This is why a site such as LifeInTheHolyLand.com and the resources available through that site are so helpful. Our picture of the week comes from a book entitled Earthly Footsteps of the Man of Galilee, which has been reproduced in electronic form and is available through LifeInTheHolyLand.com. It contains nearly 400 photographs taken in 1894. The book follows the life of Christ and the apostles chronologically, traveling back and forth through various countries. 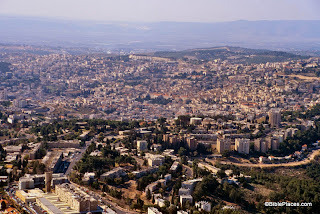 Below is a picture entitled "Nazareth from the East" and is followed by an excerpt from the book. 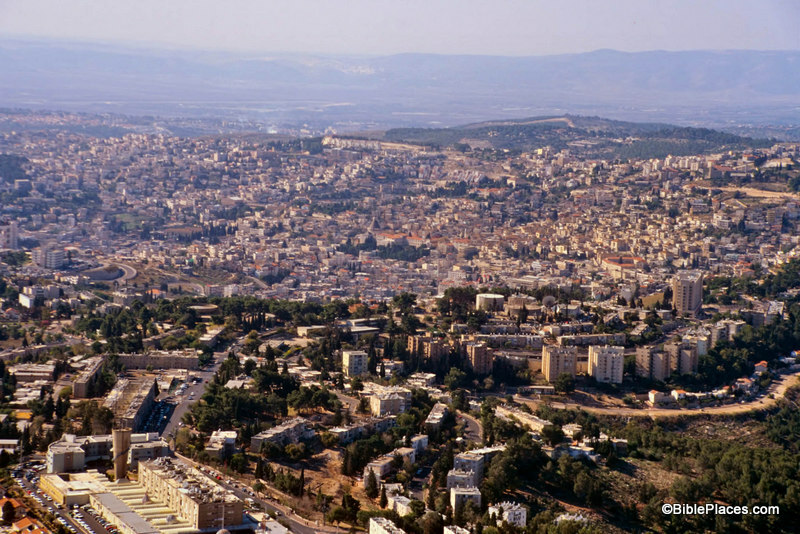 In this image, the city of Nazareth is much smaller than it is today. 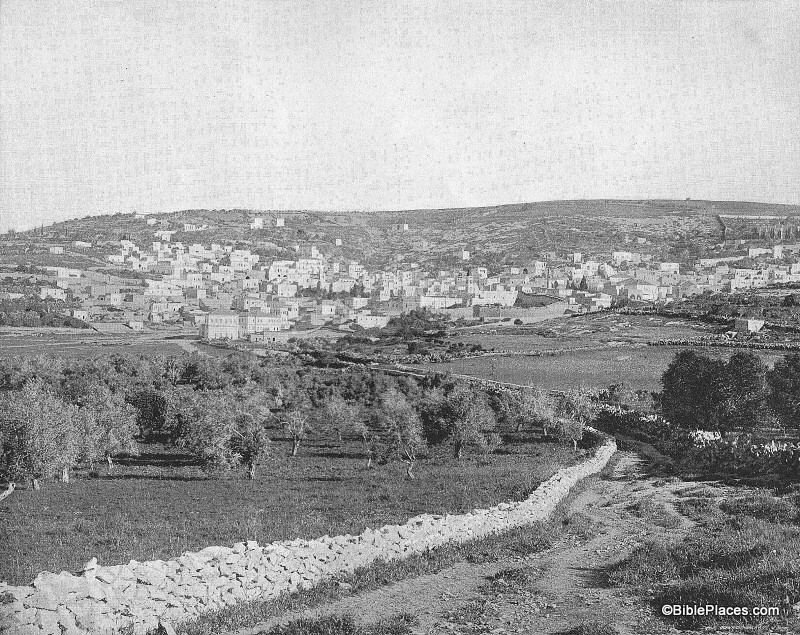 The Nazareth of 1894 was probably much larger than the Nazareth of the 1st century, and yet this photograph provides a better impression of the Nazareth that Jesus knew than any modern photograph could hope to reproduce. NAZARETH FROM THE EAST.--After an absence, according to Dr. Andrews, of something like six months, the Holy Family with the infant Jesus came in sight again of their own home. If they approached the city from the East they would get the view, as far as the topographical features are concerned, given above. Nazareth stands almost mid-way between the Jordan and the Mediterranean Sea, as we have already said. It lies on the eastern slope of the hill, from the summit of which a magnificent prospect opens out. Toward the north are the hills of Galilee and the majestic summits of the snow-crowned Hermon. On the east is the Jordan valley and in dim outline the heights of the ancient Bashan. To the south spreads the beautiful plain of Esdraelon, with Mount Tabor, Little Hermon and Gilboa; in sight, beyond, are the hills of Samaria, and on the west Carmel faces the blue waters of the Mediterranean. No traveler should miss this view from the hill behind Nazareth. It is perhaps the richest and most extensive in all Palestine. The nearer hills are wooded, and drop in graceful slopes to broad and widening valleys of "living green." In the village below, upon this eastern slope, the Savior of the world passed his childhood. His feet must frequently have wandered over these hills, and his eyes looked again and again from the summit as do the eyes of pilgrims now. Here the Prince of Peace looked upon the great plain of Esdraelon, where had so often been heard the din of battle; and upon that sea over which the swift ships were to bear the tidings of his salvation to continents and nations then unknown. The history of Nazareth seems to cluster about one remarkable event, "The Annunciation." Before that the place was unknown. But to the Christian, Nazareth is the home of the Savior's boyhood; the scene of his early labors, his prayers, his domestic relations, his whole private life for thirty years. This gives unspeakable charm to the town. Quote taken from John H. Vincent, James W. Lee, and R. E. M. Bain, Earthly Footsteps of the Man of Galilee (New York: N. D. Thompson Publishing, n.d.), p. 101, which can be purchased here. The entire work contains almost 400 images, each with an explanatory note. 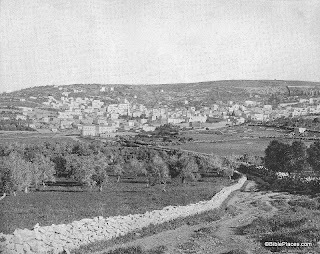 Additional images of Nazareth can be seen here (1800s and 1960s) and here (modern day). That 1894 photo should tell us a lot about the "brow of the hill on which their city had been built"